Gavin Masterson shares how he first learned of Elizabeth Cady Stanton from his courses with Dr. Iversen. 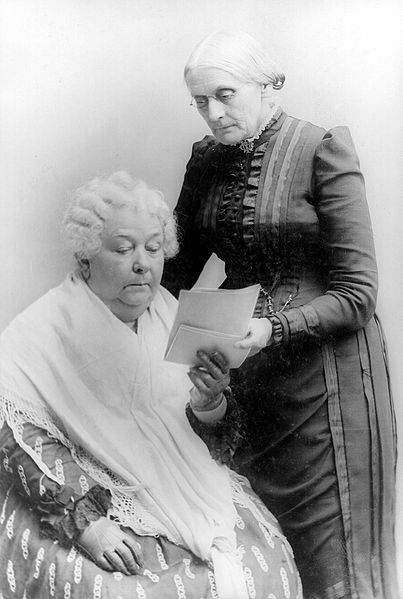 Stanton (seated) is pictured here with Susan B. Anthony. I graduated from Oneonta in 1975, admittedly, quite a while ago. Many memories have become hazy, or simply forgotten. One set of memories that remains vivid is my time spent in Dr. Iversen’s classes. These classes weren’t mere lectures, dictating the facts of the United States post WWII or whatever course you happened to be in, but amazing stories told with tremendous passion, and even more so, great insight. No one missed her classes, they were like a one-woman show! She could work a room like no teacher I ever had, smoking her cigarette with more flair than Bette Davis only wished she could. The best part was that she made each class and era of history fascinating— the day she told us the events of Ethel and Julius Rosenberg, I remember calling my parents that night grilling them on their opinions and recall of that time. I was a French major, but remember less French than I do of Elizabeth Cady Stanton, who I never heard of till then! Plus, Dr. Iversen had a great sense of humor, and was accessible and didn’t diminish our opinions, though she made us back them up, often expanding our visions and showing us things we hadn’t thought about. Hands down, the best teacher I ever had. In the years since, I often wished I could have heard her opinions on all the news events that occurred since I knew her; a luxury her family and friends had! We all owe her a great debt. Gavin, you summarized the experience of her classes and her essence wonderfully! Brought tears to my eyes. Thank you.